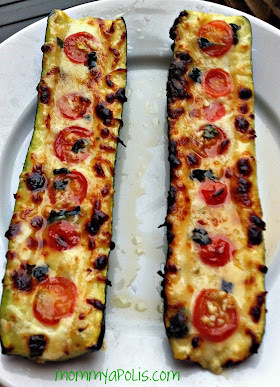 Prepare yourself for a few more zucchini recipes… Did I mention I have zucchini growing everywhere? They have taken over my garden… They are like little green monsters popping up everywhere! Oh and last week my neighbor dropped off a zucchini that a friend had given her- I kid you not it was the size of one of those little kids puffy plastic baseball bats. I made two batches of banana chocolate chip zucchini muffins (recipe below, I just added 3 bananas), one batch of zucchini bread and a batch of zucchini brownies (I just added zucchini to my favorite brownie recipe). After making all of these lovely zucchini baked goods I still had three fourths of that honker shredded and unused… I put it in my freezer just like that, hope that’s OK??? 1. Cut a zucchini in half length wise. Scoop out the seeds just to make a little indentation for the cheese and tomatoes! 2. 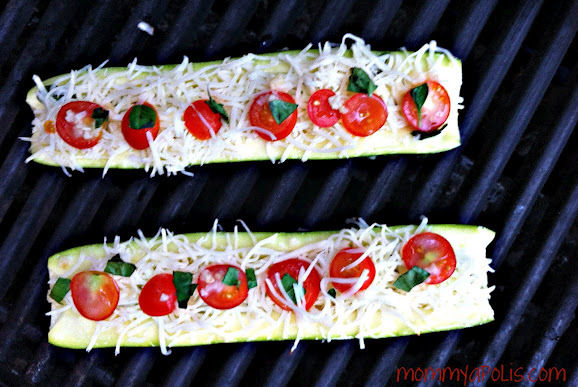 Mix some fresh garlic with either olive oil or melted butter (your choice)… Brush this mixture all over the zucchini boats.